Constipation in children is a common condition. Jasly Koo, Dietitian, Nutrition and Dietetics Department, and the Gastroenterology Service, from KK Women’s and Children’s Hospital, offers simple remedies to relieve constipation in children. ​can be relieved by increasing fibre intake such as vegetables, fruits, beans, lentils and wholegrain food products. 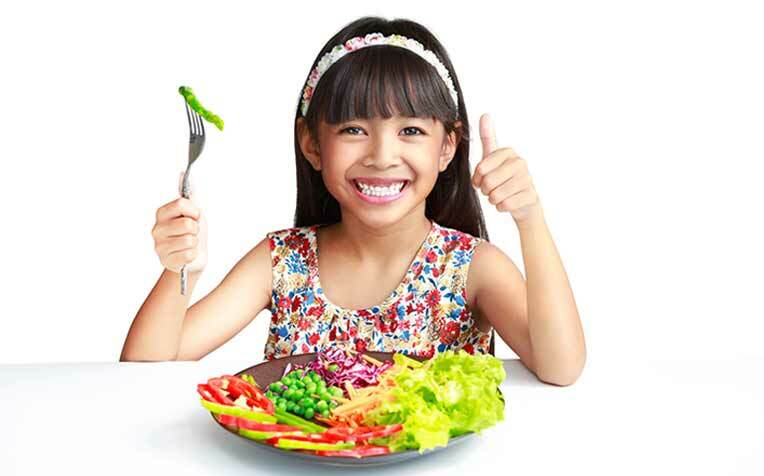 Fibre intake in children is often low, especially in fussy eaters. There are two types of fibre in our diet—soluble and insoluble. “Both types of fibre help to soften and enlarge the stool, and reduce the time taken for food to move through the digestive tract from the stomach through the small intestine, big intestine and colon, before finally being passed out,” says Jasly Koo, Dietitian, from the Nutrition and Dietetics Department, and the Gastroenterology Service, both from KK Women’s and Children’s Hospital (KKH), a member of the SingHealth group. Fibre is mainly found in fruits, vegetables, beans, lentils and wholegrain food products. The daily fibre requirement for children is calculated by their age in years + 5g. For example, a 6-year-old should have 11g (6 + 5) of fibre a day. Also, do not give more than their age in years + 10g fibre a day, to prevent giving the child too much fibre. This is especially so for young children, and children with poor appetites or who are underweight. Offer a wide variety of vegetables with different colours rather than the usual greens. These vegetables, such as mushrooms, corn, red and yellow capsicums, tomatoes, eggplant, cauliflower, can easily be added onto pizzas and in sandwiches. Add vegetables into one-dish meals such as fried rice, noodles or in pasta dishes (e.g. add shredded carrots and chopped button mushrooms into spaghetti sauce). Chop vegetables up and add into meatballs or patties to add crunch to these foods! Offer salad dressing as a dipping sauce for vegetables to increase acceptance of raw vegetables. Serve fruits as a healthy dessert after meals. Choose wholegrain breakfast cereals or add dried/ fresh fruits to breakfast items (e.g. pancakes with bananas, raisin bread) to help increase fibre intake. Serve skewers of fruit chunks or cherry tomatoes as a snack for older children. Fluid intake does not refer solely to water but also includes milk, soup, other fluids (e.g. barley water or chrysanthemum tea) and juice. Question: Is it alright for young children to drink cold water? Are there any benefits to drinking warm/lukewarm water? Answer: Drinking water is beneficial to health. It is a personal preference and there are no nutritional differences between cold and warm/lukewarm water. See previous page for home remedies to relieve constipation in children.